...some of my architecture designs. The goal here was to take photographs of blocks in order to get the best shadow from natural sunlight. We then rendered images on bristol board using mixed media to imitate our block design. The experimental rendering is of a restaurant/ bar called Squiggles. It features original artwork by Bridget Riley, a pop artist from the 1970's. The Golden Mean is said to be one of the most pleasing figures to the human eye. This rendering is a compilation of three figures based on the golden mean. 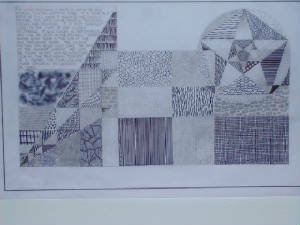 Various rendering techniques were used (fingerprints, rubbings, hatching) to create an original pattern. 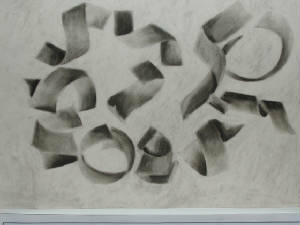 This charcoal drawing was an exercise on light and shadows. To make sure the shadows were correct, I took a digital photograph of actual curled paper under a spotlight. This was the final project for my second design course. We were required to design a skinny library on a hill for our client, Ms. Piddlemont. Our client chose a primary color scheme, and no interior walls were allowed to touch exterior walls. South light was not allowed to directly hit the books and the north wall was to be all windows. She possesed a Mark Rothko painting that she wanted incorporated into her design. Goals: To make a library that was practical on the outside, luxurious on the inside, and not too big for just one patron. Three of the walls and the roof of the model needed to be removable. the third best in the class. All of the displayed images belong to Lindsey Friedmann. You must obtain permission to use these images. Feel free to email me if you have any questions.